© Copyright of infographics by Sustrans. Because the CHIPS project wants to enable more people commuting by bike, our main target group are those respondents that are not cycling to work but would like to, those who are new to riding a bike or are starting to ride a bike again, or those who bike to work occasionally. The barriers amongst our target group differed across the different countries where cycling infrastructure also varies. 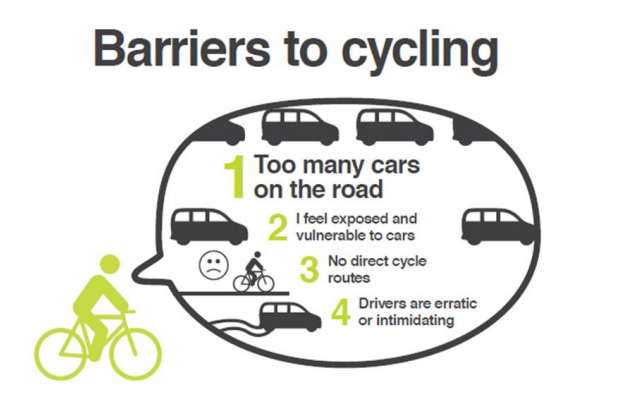 However, the overall top barriers were related to car traffic leaving cyclists feeling vulnerable. In Belfast, the weather, such as rain, ice and wind, was ranked as less of a barrier than the issue of ‘no direct cycle routes’ and ‘too many cars on the road’. Employees along the cycle highway in Flanders perceive the bad quality of cycling infrastructure as the main barrier to bike to work. In Frankfurt, the main barrier for employees of participating workplaces around the Flughafenstraße cycle highway is the lack of direct cycling routes and too many cars on the road. The exposure to cars and motorized traffic and driver’s behaviour is also the main barrier for the employees of participating workplaces around the Rhein-Neckar cycle highway. In Gelderland and Tilburg the main barrier to bike to work that was mentioned by employees was that ‘cycling to work is too slow’. 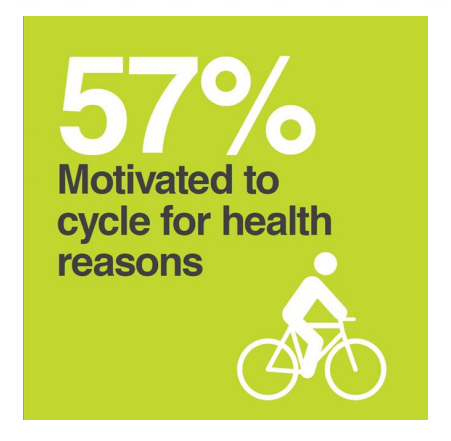 Finally, on the positive side, across all regions and cycle highways the top motivation for making the shift to a cycle commute is health. The results of these surveys were used to develop 10 campaigns to encourage our target group to use the cycle highways more. Campaigns will vary from promoting the health messages of cycling to work to workplace engagement campaigns with employers and employees. These campaigns will be implemented by all the CHIPS partners on their cycle highways. A follow-up survey with participating workplaces will be implemented in autumn 2018. This will identify employees who have made a change and now commute by bike. It will also provide an opportunity to determine to what level employees were aware of each of the campaigns and which campaigns had the most impact in supporting them to make the change to commuting by bike. Supporting this will be analysis of data from cycle counters, and information gathered from any surveys carried out on the cycle highways.